L.A. isn’t a place you dream of when you grow up in Idaho, and live in Oregon. It’s a place you curse. 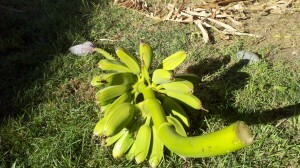 But today, as my housemate and I harvested bananas from the backyard, laughing like little girls, I was happy to be in L.A. There are some things you should know about harvesting bananas, however. First and foremost is that banana plants give off a sap that can be used as an adhesive. No really, it can be used as an adhesive. You don’t want that stuff on your skin, because it’s sticky. You don’t want it on your clothes, because it stains them hideously and immediately. And you really don’t want it in your eye. When I first moved in with Michele, she was out of town, in some far off land for a photo shoot. While I was wandering the yard, marveling at the gorgeous fruit trees, I came across the wickedly serrated sickle she had pointed out to me that the gardener had left so that she could prune the banana trees that stood along the back fence. The trees had become so large and aggressive that they were constantly threatening to push over the fence. So I set to work. I cut out dead fronds and trimmed out weedy growth. By the end, I had a pile four times the size of the yard debris bin. Eventually, I moved on to taking out entire, dying trees. Pulling down great monsters twenty feet high, by climbing on our little ladder with my sickle and taking them out in pieces. The pruning did wonders, and we began to see fruit. The great, alien banana blossoms appeared like velvet, purple hearts beating at the end of green snakes. The trees grew heavy, bowing under the weight of the fruit. It’s an inspiring thing to be surrounded by food growing from the trees. As the summer has worn into fall, I’ve been ever more delighted. First the enormous fig tree in front began dropping its swollen bounty. Then the avocado tree took its turn, pummeling us with miniature fruit scarred with squirrel bites. One day I noticed a square-ish, green fruit on the ground and looked up to find the side yard dominated by a persimmon tree. Even our cactus gave me my first taste of prickly pear. In the last few days, my quest for fruit has elevated. I pulled out the machete I’ve kept in my car for the last couple of years (for fire-making. I also keep a flint), and Michele and I went to work chopping up the trunk of a banana tree I’d cut out. I laughed about how Michele’s girlfriend would never let us play together again if one of us got hurt. Very soon, Michele had disappeared behind the back of the detached office to hack out some trees that she didn’t want growing there. “Like fruit? !” I’d been counting the blossoms proudly, noting their size and the size of the trees, and whether there were dead trees needing to come out nearby in order to give them access to more nutrients. The trees behind the office had escaped my count completely. 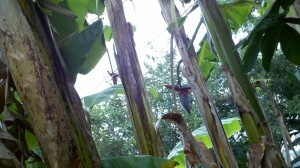 I scrambled to hand the ladder through the tangle of trees to Michele, and climbed back to get a look at the bananas. “WOW!” There were a lot of them. And they were ready to harvest. We already had about 15 bananas ripening in a paper bag in the pantry from an earlier mission that had me atop a ladder, leaning over the fence with a pole saw, trying to retrieve the fallen bunch from the neighbor’s yard. But these bad boys behind the office were too good to pass up. “Oh yeah, just by the way, the sap totally stains,” she reminded me. More than that, the sap is incredibly sticky, and starts stinking pretty quickly. She made it through and the heavy bunch dropped a foot. I grabbed at the blossom, hanging down toward me, and caught the three foot bunch when it swung down. “Wow, it’s really pouring out!” I could hear Michele’s surprise as I moved around the corner to shove the bunch through the trees into the grass of the back yard. I took a second to marvel at the glorious harvest and then headed back to where she was murmuring. Michele made her way down, rubbing at her left eye. “I think it’s in my eye,” she lamented when she hit the ground. “Go wash it.” I said. I think the seriousness of the situation hit her all at once. She took off in a sprint for the back door, leaving her shoes in full stride on the deck. “My eyelashes are stuck together.” She was in the bathroom running water into her eye. Banana sap in eye. Nothing. Getting banana sap out of eye. Nothing. I got banana sap in my eye. Eventually I hit up on a couple of passing references, one to a guy who “almost lost his eye” when a bunch of banana sap exploded into his face, the other a parenthetical note that you “DO NOT” want to get banana sap in your eye. After maybe 20 minutes of flushing her eye, Michele emerged. Frankly, pretzels and Mad Men was as plausible a cure as anything I turned up on the internet. While Michele applied her home remedy, I cleaned up the bananas, cutting the bunches from the stalk and washing the cobwebs from the fruit. 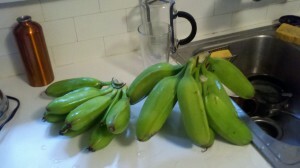 By the end of the night, we had another forty green bananas closed into paper bags to ripen in the pantry. Thankfully, Michele’s girlfriend was suitably impressed and didn’t ban us from playing together. It only took another 3 or 4 days for Michele’s fuzzy eye to return to normal. Next time w play “banana farmers” I’ll lay off the warnings about machetes, and stick to the warnings about the real danger: banana sap. It’s lovely to see you posting again! I too had an experience of bananas sap falling in the eyes.is it ok if you just wash the eyes?